At the beginning of the world, the King of Heaven ordered Yagumi, a god, to create islands in the world. for a stone column for his plan and creation. and called it the Miyako Islands. The King was very satisfied with Yagumi's work, so he then called the god Kui Tsunu and the goddess Kui Tama to go down to the Miyako Islands to populate them. Kui Tsunu and Kui Tama descended onto the Harimizu Shrine where they still reside to watch and protect the islands. In fact, the island's name, "Miyako"
first came into record in 1317 in Chinese manuscripts. 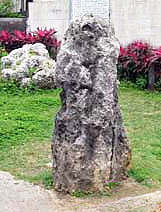 The Head Tax Stone stands at 4 ft. 7 in. suffering under the new rule. and Ishigaki Island had to pay heavy tax for the new ruler. taller than the height of the Head Tax Stone had to pay the tax. and the Parliament, the decision was made. a movement that was started by several citizens. under this tax for about 300 years. In 1771, a big tidal wave called "Meiwa"
flooded Miyako Island and killed over 2,500 people. was shipwrecked at Yabiji in Ikema Island. Captain Broughton was very pleased and impressed by people’s charity and thoughtfulness. such an island and admired the people of Miyako Island. a tribute ship from Miyakojima drifts to the shore of Taiwan. The locals kill 54 of the crew members, three of whom were drowned to death. Only 12 crew members were able to return to Miyako Island safely. the German ship, Robertson, is shipwrecked in Miyako Island after a typhoon. Fortunately, the eight German crew members are saved by the people of Ueno village in Miyako Island. 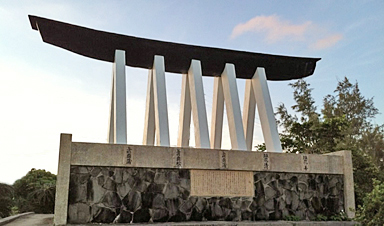 The Germans were very grateful for the hospitality of the islanders, so in 1876, the German emperor sent a monument as tribute to Ueno village. five fishermen from Hisamatsu village report the sighting of a “Russian Baltic fleet". At the time of the Russian-Japanese War, the Japanese military was cautious of any movement from the Russian Baltic fleet. On May 25th, information that a Baltic fleet went north to the eastern side of Miyako Island was brought to an executive of Miyako Island. 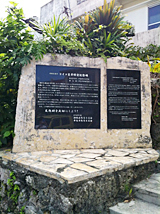 The report was sent to armed forces and the combined fleet of the mainland, but Ishigaki Island had been the only island with a telegraph station. So, the five fishermen rode in a small sabani boat for 15 hours, approximately 100km. After arriving to Ishigaki Island, they walked for 5 hours to get to the telegraph station, where they finally sent a telegram. However, a ship called Shinano-maru had already sent a telegram about the enemy fleet one hour earlier than the fishermen. Unfortunately, the effort of the five men was not recognized. In the Showa era (1926-1989), this story was introduced in textbooks in junior high schools as the “Regretted One Hour”. The courageous action of the fishermen was commended by the Governor of Okinawa and they became famous as the "five brave men". the first newspaper is published in Miyako Island. Miyako Electric Co., Ltd. is also established, providing electrical service to some parts of the island. cholera spreads and approximately 2,000 people are infected. More than 900 people die. 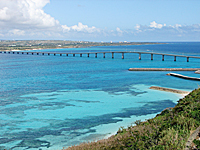 Miyako Island becomes a local government on the same level as the mainland for the first time. The first national census is carried out and Miyako Island had a population of more than 53,000 people. Japanese defense corps arrive at Miyako Island specifically to defend the island, with a force of 28,000 army and 2,000 navy members. This totaled to a military force of 30,000. Approximately 10,000 islanders were forced to evacuate to Taiwan and Kyushu to avoid confrontation with enemies. a British fleet bombard Miyako Island. Much of Hirara city is burned by an air raid. The military administration of Miyako Island is established at the same time the United States Navy was stationed. Typhoon Elsie, with a maximum wind speed of 70m, passes through Miyako Island on July 23, causing great damage. There were 25 deaths, 10 missing, 39 injured, and 1, 315 houses destroyed. 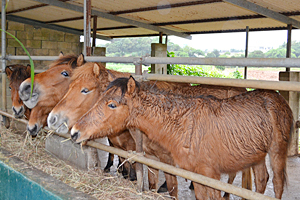 The Miyako Island civil administration office is changed to interim municipal authorities and exists for 1.5 years before the Ryukyu government was established in April 1952.
severe drought occurs for the first time in70 years. It had not rained for 137 days between January 15th and May 31st. The sugarcane harvest that year is 2.2 tons per 10 Acres, which is less than 50% of a usual year. 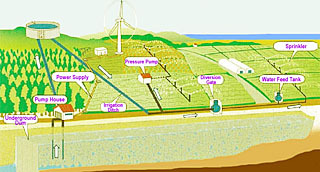 all islands of Miyako Island are provided electricity and people are able to use electric appliances. a large typhoon known as Colla (the second Miyako Island typhoon) passes through Miyako Island from September 4th through September 6th and causes large damages. With a maximum wind velocity of 60.8m and maximum instantaneous wind speed of 85.3m, it had the most powerful wind velocity on Japanese record. 1 dollar = 365 yen. Elections for governor, member of the prefectural assembly, and the Lower House are held for the first time after Okinawa’s return. During this time, the NHK radio station begins broadcasting in Miyako Island. an additional building was added to Miyako Hospital. Phone service of Miyako Island becomes dial phone. 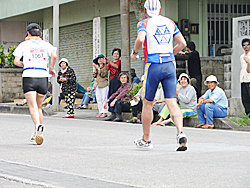 In April 27, the first Miyako Island Triathlon is held. the Ikema Bridge is completed. 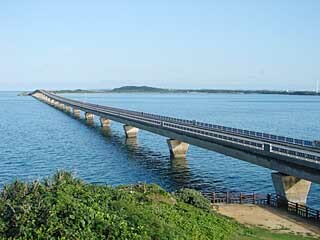 the Kurima Bridge is completed. 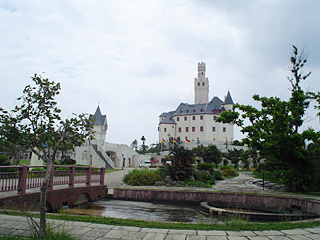 a theme park introducing German culture, the “Germany culture village", is built in Ueno village. On July 21st, 2000 (Heisei 12), German Prime Minister, Gerhard Schroder, who had visited Okinawa for the Okinawa Summit, visits Miyakojima. Due to the events from 127 years ago when the people of Ueno village helped the crew of a shipwrecked German merchant ship, a special connection was made between Germany and Miyako Island. The underground dam is completed after 14 years of construction. In September, a large-scale typhoon 14 attacked Miyakojima. It was the fourth recorded with a maximum instantaneous wind speed of 74.1m, and a super low pressure with a core atmospheric pressure of 912 hectopascal. 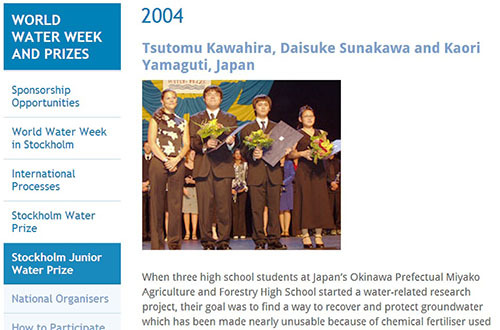 the Miyako Agriculture and Forestry high school won the “Eighth Stockholm Youth Water Grand Prize” in an international contest held in Stockholm, Sweden, for their study to keep groundwater secure. On January 24, the Japanese Emperor and Empress visited Miyakojima for the first time. on October 1st, the five cities, towns, and villages (Hirara, Gusukube, Ueno, Shimoji, and Irabu) were merged to become Miyakojima-city. A movie theater was restored in Miyakojima for the first time in three and a half years. 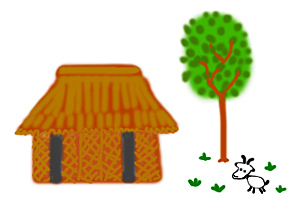 Copyright © 2010 - 2014 Miyakojima Kids Net. All Rights Reserved.